When potholes and other hazards start taking over an asphalt surface, Hal’s Construction can patch and sealcoat the damaged area. The degraded pavement will be removed and the damaged area thoroughly cleaned with brushes, blowers, power sweepers and even pressure washers. Oil and grease spots are cleaned and primed to ensure bonding of the asphalt emulsion sealant. Properly preparing the damaged area is the key to achieving an effective bond when the damaged area is filled with fresh asphalt and sealed. Cracks that are wider than one-quarter inch are filled with super-hot flexible sealant prior to applying two coats of sealant to the repaired surface. The newly repaired asphalt surface will then be cordoned off until the pavement is ready to be restriped in anticipation of many years of reliable service. Sealcoating your new or existing asphalt will greatly increase its lifetime. Asphalt that has not been sealcoated is porous and allows water to seep through these pores; this causes deterioration in wet and freezing conditions. Sealcoat fills these pores, keeping the water on the surface to drain the way it was intended. Seal coat material is a mineral reinforced polymerized bituminous emulsion that is applied with a motorized squeegee machine. Sealcoating is a seasonal job because it requires good weather. 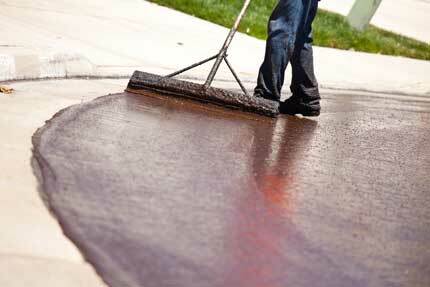 Sealcoating should be scheduled early in the year to get your work done in the summer months. Asphalt sealcoating is recommended every 3–5 years to maintain maximum protection. Professional asphalt repair and sealcoating services provide an affordable means of avoiding the heavy cost of replacing parking lots, driveways and other blacktop surfaces. Hal’s Construction has been delivering premium asphalt sealcoat repair services in the greater Portland, Oregon area for more than 40 years. Asphalt maintenance is worth doing right the first time. Hal’s Construction provides free project estimates and guarantees all materials and craftsmanship. 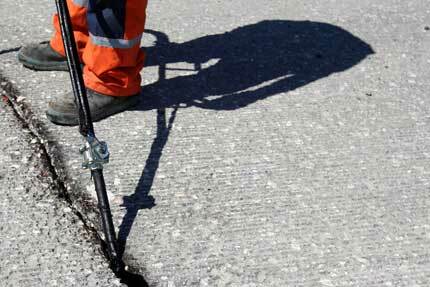 Cracks usually form from expansion and contractions in the ground. Paying close attention to these cracks is always a good idea; this is because the sooner you seal or fill these cracks, the less likely they will continue to grow. After crack repairs are complete, it is recommended to seal coat for additional protection. If your windshield developed a crack, you’d know that replacement was vital, because the crack would spread and eventually your windshield would fail to do its job. Asphalt crack repair is another issue that needs to be seen to. After all, asphalt is constantly subjected to pressure, environmental changes, and wear and tear from vehicles. If that windshield crack can’t withstand air alone, imagine how these factors can tear up your asphalt! Asphalt sealcoat repair services should always be delivered by a licensed, bonded and insured asphalt contractor. Performing preventative maintenance on paved areas can significantly extend the life of asphalt surfaces. Heavy vehicle and foot traffic, not to mention the wet and blustery weather of the Pacific Northwest, will cause asphalt surfaces to degrade and crumble over time. Hot sunny days, snow, sleet and freezing temperatures also contribute to the cracking and allegation of paved surfaces. When an asphalt surface begins to take on the appearance of alligator skin, it’s time to give the Hal’s Construction asphalt repair team a call. Hal’s Construction is a family owned business with over 40 years of experience meeting the commercial, residential and industrial paving needs of the greater Portland area. Please call (503) 226-4999 to receive a free consultation and project estimate. All materials and craftsmanship are absolutely guaranteed.